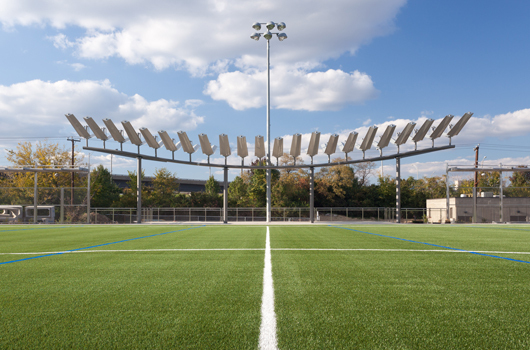 ALERT: Field #1 is closed due to turf replacement and should reopen by the end of June. 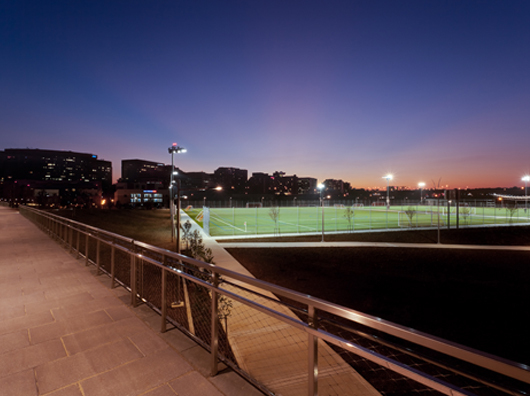 With more than 30 acres of recreation and open space, Long Bridge Park is a distinctive showplace of environmentally sound redevelopment with a central expanse of attractive public green spaces and high-quality outdoor sports and recreation facilities that are accessible to all Arlingtonians, conveniently located with nearby urban corridors and the Potomac riverscape, and coupled with complementary private redevelopment. 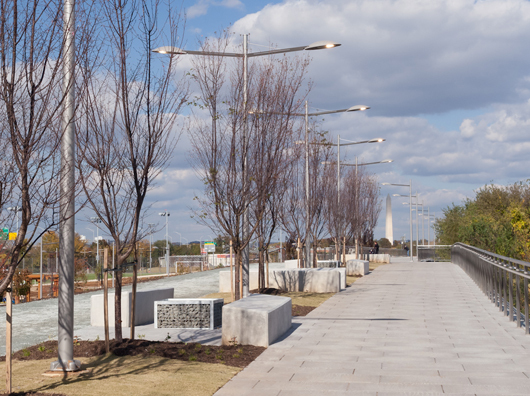 Located north of Crystal City adjacent to I-395, the park features three full-size, multi-sport, lighted fields, a network of walkways, an overlook at the north end of the park with views of capital monuments, Wave Arbor — a public art feature by nationally recognized artist Doug Hollis, healthy vending machines, a three-quarter acre rain garden that directs runoff from the park’s sports fields & parking lot into a planted garden of native shrubs and perennials, and rectangular synthetic turf fields – turf field #1 was funded by Marymount University and is used as the home field for the men and women’s soccer and lacrosse teams (permit takes priority). 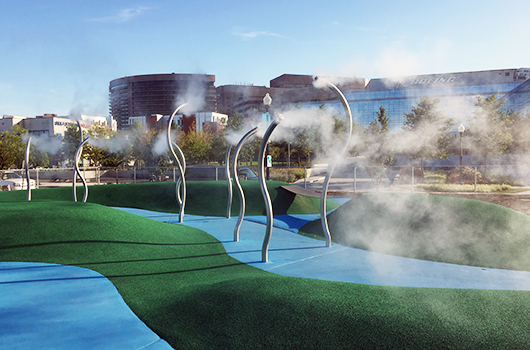 For kids, there are playgrounds for ages 2-5, 5-12 and an interactive fog area. It’s a great place for train, plane and bird watching. 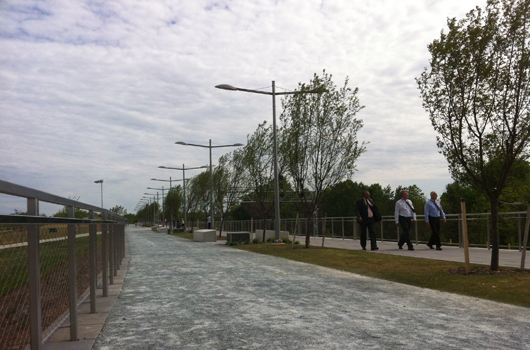 The park features a raised walkway, or Esplanade, that overlooks the playing fields, the Potomac River and Roaches Run Waterfowl Sanctuary. Parking is metered Monday-Friday 8 a.m. to 5 p.m. The Crystal City parking map lists all area garages and locations. 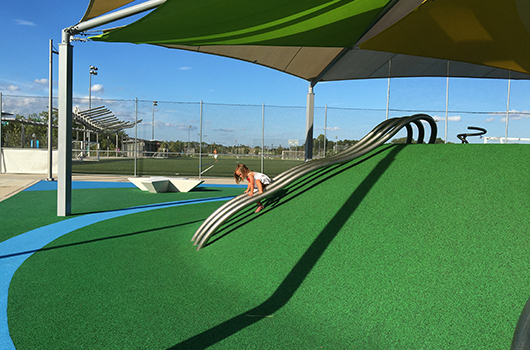 Learn about the Long Bridge Park project.